Der VK 30.01 (D) ist ein deutscher mittlerer Panzer der Stufe 6. Im Winter 1941/42 gab das WaPrüf 6 technische Richtlinien für einen neuen 30-Tonnen-Panzer heraus. Der Entwicklungsauftrag ging an MAN und Daimler-Benz. Die Prototypen sollten bis Mai 1942 bereit stehen. Am 13. Mai 1942 wurden jedoch nur Vergleichsdaten der Projekte eingereicht. Man gab MAN den Vorzug, das Projekt von Daimler-Benz wurde gestrichen. This is a versatile and adaptive medium for its tier. Like other German tanks it is best used to control area at range on the battlefield – and like the Panzer 3 and the Leopard 1 line, this tank does that by maneuvering in that area to snipe and ambush. Capable weaponry demonstrates the versatility in playstyle of this line, compared to a dedicated spotter. But however, your survival will start to rely more and more on staying unspotted. Der VK 30.01 (D) führt zum VK 30.02 (D). Capable scout: View range is on par with American mediums. Decent camo at range, but not wholly reliable. Sniper capability: Reliable gun penetration and full-aim accuracy. Decent shell velocity. Make each shot count! Strategically mobile: excellent top speed allows it to escape cover, flank, or eventually reposition if necessary. Survival potential: sloped armor and smallish turret. Deflects same-tier shots, especially at odd angles. Decent gun depression: -8° allows defensive usage of small ridges/slopes in terrain, but not to attack over hills. Defensive: Relies on cover and staying unspotted. Requires good knowledge of maps to escape into cover if necessary. Situational gun: Reliable steady damage means low alpha and low RoF. Bad aiming without skills means stopping and no poking. Armour: Weighs the tank down and can be unreliable against multiple enemies. Best not to stay to trade. Frustrating maneuverability: While better than most, slower base turning and acceleration than Cromwell or lights. Jack of all trades: heavier and slower compared to a light tank; gun is worse than a specialist TD or medium. As with the introduction, this tank is quintessentially German and controls the battle at range – but with the help of a fast engine to maneuver around the enemy in concealment, rather than meeting them head on with heavy armour. This tank is well balanced and plays like a bit like the Panzer 3 but two tiers higher. 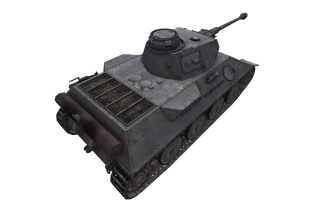 However, comparing it directly to its Panzer 3/4 predecessor the VK 30.01 (D) is heavier and thus not quite as agile and reactive, but its tactics still involves using the tank's mobility to move behind, into, and around cover; and then to use its weapon and vision range to hit enemies from afar, while using its camo and sloped armour to deflect enemies off its trail. While more sluggish, this tank can still position well at its top speed if the situation is noticed quickly and the tank is given time to accelerate. Speaking of position, the best place for it is at range on a flank to maximise the gun's strong points while reducingt e. While not durable by itself, this tank excels at using terrain to stay safe: it has decent camo, excellent view range, and can hide behind ridgelines, where the decent improvement in gun depression to 8° degrees (with the top turret, a reduction of -2° from stock) allows it to get off shots comfortably while the small turret profile and decent armor allow it to absorb shots. As for Weaponry, the top 7.5cm L/70 gun very typical of the tier 6 German tanks, and while not larger calibre the barrel length gives it a serious improvement in reliable hits due to its accuracy and penetration. This allows for more reliable and comfortable mid-to-long range shots as a flanker, compared to the smaller cannons in previous tiers. You will notice the gun can eliminates isolated enemy tanks much more reliably than the shorter L/48. With Camo and 6th sense to reduce exposure, the weapon is excellent for harassment and subterfuge. A notable weakness of this long 75mm is the raw damage: the alpha damage is alright, but on this tank in particular it has a poor rate of fire compared to the other mediums. These lead it to best engages at long mid-range, where the accuracy advantage is in your favour, but close enough that leading and the shell velocity isn't a significant disadvantage. On the other hand it is vulnerable in close range because other mediums will fire faster, with faster turret turning too, and these will easily be able to blow you up before you can kill them. While heavier than a light tank this VK can be a bit more agile than weightier mediums. The reverse speed is decent enough that if you end up too far forward and don't have the driver's traverse speed skill (Clutch Braking) in order to get out fast enough, you can go down swinging as you duck back behind hills in order to put a few shots in your enemies. While you can use your gun to shoot targets lit up by other spotters, with care you can also shoot your own targets if you have several layers of bushes to obscure your fire, or a good ridgeline to poke over. Regarding peeking out of cover, it can work against single opponents but you should avoid it against multiple enemies. This is due to the low alpha will mean that you take more damage on each peek than you can dish out, and the fact you will have less time to aim and reduce the horrible dispersion. Both of these factors mean that it is rare that this tank will trade shots well in a straight fight, so drop your light and U-turn out of there if possible. The strategic mobility allows you to relocate across the map, but due to the weight of the armour the tank has poor acceleration meaning that you should position before you shoot. With the top engine, you should rarely use your top speed. It is especially bad when deploying, as it will get you ahead of your supporting team without the option of an easy retreat; instead, use it later when you need to switch flanks. Note that while the top speed is good, this tank is not the most agile: turning and acceleration are subpar, and then further worsened by terrain resistances. This is compounded by comparison: while statistically similar to its Pz 3/4 predecessor, the actual result is far worse due to the different ratios between top and stock engine power. Fuel consumables can help mitigate this disadvantage. More than the chassis's defensive characteristics, not being shot at all due to vision denial is how the tank was meant to survive. The VK 30.01 (D)'s view range is excellent and with Coated Optics, will clear 400m with ease. It can get up to the maximum with boosts (vents, Commander's Recon skill, chocolate). While it is somewhat stealthy with its low profile and small turret, it is no tank destroyer, and it is possible to be spotted at 350m by scouts/spotting tanks, even if you use with camo and skills. However, you must try and stay concealed when possible, as it will give you much more time to aim your gun in peace and get the first shot off, without taking hits (especially if multiple enemies are around). The chassis is arguably better than the other tier 6s and while not heavily armored, is still very survivable. The most visible point of the design is the very useful sloped armor. It can bounce some shots at long range (except tank destroyers), but the thickness will be reduced if fired down upon at close range. This causing serious problems against heavies and other tall tanks, and the armour will get penetrated by most guns. Positioning yourself against enemy positions is key to not being shot, so unless you are sure nobody has a good shot on you, you should not be shooting nor stopping. It should also be noted that peeking at targets who see you at any range is a bad idea anyway, due to the poor alpha. While it doesn't have great gun depression for targets far below a hill you're on, the 8 degrees of gun depression is an improvement over the Panzer 3/4 and can allow it to shoot back at enemies further away from the ridge. Once in a covered position, using terrain is crucial to your survivability compared to the well armoured VK 30.02 (M). It is vital that you understand this, as later on the gun depression of this line will get relatively higher and end up favouring a 'Western'/hull-down approach, as compared to the Eastern Eurasian style of flanking around quickly. For example, if you are peeking for shots on a ridge or shallow hill, you can still be lit, but threat to yourself is minimal due to the relatively thick turret. At the same time you should not stay in one place too long, in case the enemy pre-aims their guns to your position. Put your mobility into use and shuffle a few metres to either side, or retreat and turn to pick a different flank entirely. As a brief comparison to the other medium sniper, the aggressive British Cromwell, the VK is more suited to cover and distance: it has stronger view range, as well as better accuracy and penetration. It gets less ability to move between positions and react, as the VK31D has worse terrain resistance and the weight of the armour. This is reflected in worse acceleration and worse realistic traverse speed (as opposed to the statistics). It is preferable to eliminate the Cromwell at range, preaiming from cover. This is especially effective damage trading if he gets too cocky exposing himself over a hillcrest or ridge, or he is distracted. If you are too far forward and get engaged in a duel at brawl range you should attempt to angle and get away. Put distance between the two of you and if possible back out into a location behind cover, before turning around. Equipment and skills – these customisations maximise the strong vision and compensate for the shortcomings of this tank. Camo and staying hidden is important especially when you aren't top tier, so firstly take Recon, Camouflage, and Clutch Braking. These are the most necessary, to let you notice, hide from and then escape danger, which all improve the survival of the tank. Afterwards, improve the versatility: with Smooth Ride to help aim, and Situational Awareness to defeat camo, and finally the perks Sixth Sense and Designated Target, which are excellent for vision control. With equipment, use equipment that does not require the tank to be stationary to be effective. Coated Optics is important for this tank as it brings its view range over 400 meters - allowing it to spot, and maintain sniping range effectively. The Gun Rammer is mandatory whatever you do, as the tank has fairly low DPM - and anything to help this is very important. The last slot can be a wash, situational or mainly a matter of choice, and it very nearly depends on what you prefer, but the Vents are probably the best choice. The single most notable increase is to Gunner skill which will reduce maximum accuracy by 2%, like a Vertical Stabiliser. It will also boost the reload and synergise with crew specialist skills such as Camo or Recon. However, the downside of vents is that the boost assumes a skilled crew. The effect can get more noticable when stacked with other effects such as chocolate and full Brothers in Arms, but even without these the effect on accuracy and specialist skills helps a lot. A Gun Laying Drive is not a replacement for a vertical stabiliser, as there is no immediate effect during movement for a poke or snap shot. This is worse than the 2% stabilisation effect of vents. Secondly, the rate of fire is not high enough to help useful in sustained shooting (while stationary) as the gun will likely fully aim during the reload for the second shot and after, and only bloom when going out to shoot. If anything a GLD reduces the emphasis on aiming for an ambush while concealed – which is a waste as while hidden, you can take as much time as you like and this does not meaningfully reduce your exposure to enemy fire. Likewise, Camo Net is not effective as useful on such a mobile vehicle that can move to avoid fire. You could get off more shots before repositioning, but the 1.02x multiplier to Camo will be more useful than 20% while being a sitting duck for arty. 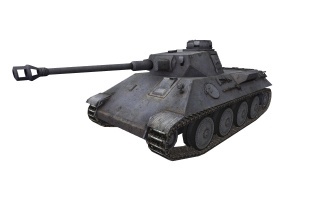 Although it takes some getting used to, this tank proves itself quite well and has earned a place in many players' garages due to its versatility. This tank prepares the player for future tanks in the line. The FuG 12 Radio carries over from the Pz.Kpfw. III/IV. Mount it immediately. The Maybach HL 230 TRM P30 Engine can be researched without upgrading the suspension. 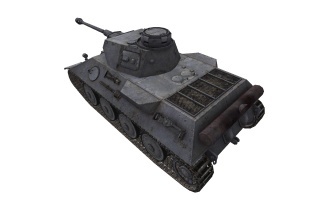 Research the VK 30.01 (D) turret. Research the 7,5 cm KwK 42 L/70 gun. If you would rather have more firepower than more speed, research the VK 30.01 (D) verstärkteketten Suspension, the VK 30.01 (D) Turret, and the 7,5 cm KwK 42 L/70 Gun. Alternatively, you only need the turret and then gun if you forgo any equipment and engine upgrades. The requirements for the new development of a 30-ton schwere Panzerkampfwagen included the ability to mount at least the 7.5cm KwK L/24 main gun with a desire to fit the 10.5cm KwK L/28 if possible. Later, in 1941, the German Army encountered unexpectedly-heavily armoured enemy vehicles such as the Soviet T-34 and KV-1. Plans were then made to instead mount the more effective 8.8cm KwK L/56. Krupp were directly contracted by Porsche to produce the turret to house the 8.8cm KwK L/56 and the two teams worked together to develop it for the VK 3001 (P) chassis. A fully developed drawing with the Krupp turret was completed, dated 5 March 1941. The Krupp turret would go on to be used on both the Tiger (P) and the infamous Tiger I. Uncommon for tanks at the time, Porsche selected a Gasoline-electric drive train. The front drive sprockets for the tracks were driven by two electric motors mounted forward in the hull. Two, air-cooled, V-10 gasoline engines, mounted toward the rear of the vehicle, were each connected to a generator to produce electricity. The generated electricity was then used to power the motors. Each engine produced 210hp at 2500 RPM; a total of 420hp was therefore available to drive the generators. Diese Seite wurde zuletzt am 25. Oktober 2016 um 13:52 Uhr geändert.